I decided this would be a good idea to encourage people to post their lock slaying accomplishments into one megathread. I realize some of you already have your own threads. Feel free to continue using them. This thread will be open to anyone wanting to share their murderous conquests of picking, impressioning, bypassing, etc. Please post photos! We shall see where this goes. I'll start off with this 5-pin BEST SFIC I removed for Riyame from an old BEST padlock. Despite being only 5 pins it put up one hell of a fight and took a few hours. I had to lube it up with some Rem Oil as the feedback was just that bad. Xeo... I remember you battling it out with that beast of a BEST, lol. Good times! 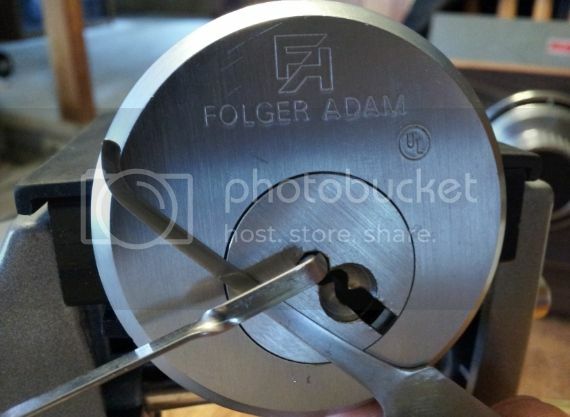 A five pin Folger Adam prison lock. Killed with my Mogul murdering pick made from a butter knife blade. That was a different one. This was my most recent slaying. xeo wrote: That was a different one. This was my most recent slaying. Oh... this is another old stubborn one then... ok. Sometimes it seems age can be our biggest enemy. Oldfast wrote: Xeo... I remember you battling it out with that beast of a BEST, lol. Good times! You mean a pic of the RR BRINK? Here's another one I just removed a few minutes ago. 7-Pin BEST from a Los Alamos Scientific Laboratory padlock. It required extremely hard tension and more Rem oil. Dorma RS8 (like the DOM RS-8) Has some side pins in it. Here’s mine. Click on the pic to get a better look at the keyway. Not as flash as some of the locks that you guys have but it was a buzz to eventually get it SPP. I mainly practice on padlocks as they are the easiest for me to acquire. Got this lock as the key was lost. It is not a Federal cylinder. The cylinder is a 6 pin 3rd party restricted keyway (very narrow as well as paracentric). I think it is a Yale though there are no markings on it. I know this lock now (NOT in the Biblical sense ! ) and have popped it three times. Here is the latest on that is giving me grief . Amazingly, a cheap Chinese lock but a look at the bitting along with the usual sloppy tolerances are working against me. I selected it because of the bitting. I might have to step up to the grinder and make an extra long hook. "Sometimes it seems age can be our biggest enemy". Nice bitting on that cheap Chinese lock, Neilau. Perhaps an offset diamond? Abus Rock 83/80 with Series 2 Core. Keyway is only a KW1. 5 pin with spools. Took me a few days but I got it! I used a short hook and a custom tension wrench. Still not consistent, it was just my first time picking it with 6 pins. But I'll get it eventually! Used a short hook with a small groove I made in it.